Durham make it three wins from three with a comfortable 5-1 victory over Oxford United. 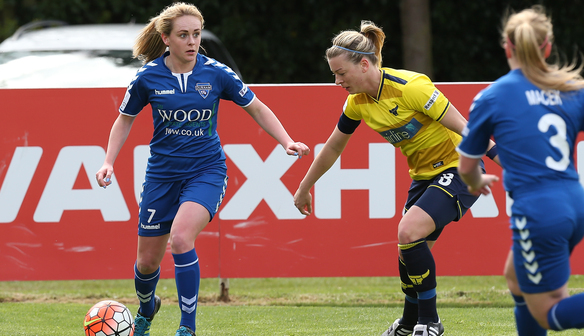 Beth Hepple was over the moon after bagging a double as Durham put five past winless Oxford United in the WSL 2. Sarah McFadden, Nicki Gears and Nat Gutteridge also got on the scoresheet as the Wildcats made it three wins from three in the top versus bottom clash. Hepple scored the fourth and fifth goals for her team but refused to get too far ahead of herself after helping her side maintain their perfect start to the WSL 2 season. “I’m buzzing and feel over the moon. To keep up our consistency from our first games is great,” said Hepple. “Before the game, we were saying that we are not looking at the league table because it doesn’t matter. “Anything can happen at the start of the season and we just have to focus on our performances and that’s what matters. “It’s always good to get a good start and get a bit of momentum going, but that’s over now and we have to focus on Aston Villa next week. The league leaders took the lead with just two minutes gone as Demi Lambourne flapped at a Hepple corner allowing McFadden to tap in. The lead was doubled when a diagonal ball found Gears, who soared past Rosie Lane before slotting her shot home. United clawed one back through Ini Umotong’s third goal of the campaign but the visitors’ two-goal advantage was restored in first half stoppage-time through a Gutteridge header. That just left Hepple to add two late on, the second a cheeky lob over Lambourne. Oxford striker Umotong said she was pleased to have scored but would rather have seen her team pick up their first points of the season. She said: “It is a bit demoralising. We always knew coming into the game it was going to be a tough game. “Durham have picked up nine points out of nine, so it was going to be tough, but we’ll keep grafting and pick up the points we need. Durham (4-3-3): Helen Anderson; Ellie Christon, Sarah Wilson, Becky Salicki, Chloe Macek; Beth Hepple, Sarah McFadden, Rachel Lee; Jordan Atkinson, Nat Gutteridge, Nicki Gears.